The wheelbarrow or garden cart is an absolutely indispensable garden tool. There will always be things to haul. The more gardening you do, the more things there will be to haul. Compost, garden tools, plants, weeds, heavy cement garden ornaments... Without a wheelbarrow or garden cart many gardening chores would not be possible. But which is best for your needs? While wheelbarrows and garden carts perform basically the same functions, they each have their pros and cons. Wheelbarrows have sloping sides and 1 to 2 front wheels. You walk behind the wheelbarrow, making it easy to control and maneuver. They are especially handy for loose materials which can be dumped out, like compost, soil, weeds or gravel. Garden carts have flat bottoms and straight sides. Garden carts are designed to be pulled, with two or more, often large, wheels. They are more stable than wheelbarrows and generally can handle larger loads, but can also be more difficult to maneuver on non-smooth surfaces. Larger carts are well suited to heavy loads and bulky cargo, such as stones, firewood and those heavy cement garden ornaments. There are also some very useful, smaller garden carts that come in handy for toting tools and flats of plants. The smaller garden carts often come with a cover, so they can do double duty as a place to sit down. Ultimately, the choice of wheelbarrow or garden cart is up to the user. Many gardeners find they have need of both. If you are just getting started as a gardener and the size of your garden and property is not overwhelming, a sturdy plastic, 6 cu. ft. wheelbarrow would be a good choice as an all purpose tool. 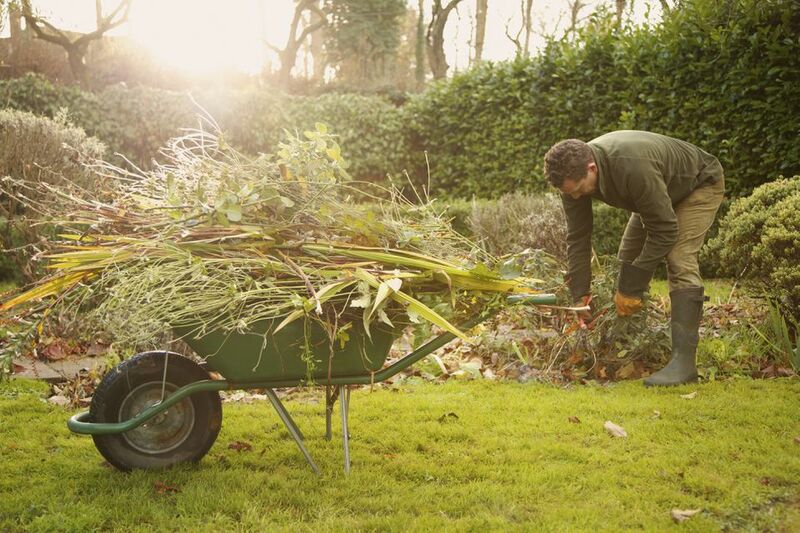 Once you gain some experience about the types of garden chores you need a wheelbarrow or garden cart for, you can run through the following considerations, check off the features that appeal to you and make a decision of what would work best for you in your garden. Size and Strength of User Larger isn't better if you can't move or lift it. If you have trouble walking, pulling a garden cart might be easier than pushing a wheelbarrow. If you have trouble lifting, the lower bed of a garden cart will be easier to get things in and out of. If you have trouble bending, a tilt and dump wheelbarrow may better suit your needs. Size of garden of landscape: Bigger isn't always better, since larger wheelbarrows and garden carts can get very heavy and hard to handle. But larger capacity can mean less trips. Topography (Hills, rocks, uneven terrain...): Garden carts handle better on bumpy terrain, but can get ahead of you on an incline. Construction: The tray should feel solid and sturdy. The handle(s) should be smooth, with a comfortable grip. Metal: It's strong and durable, but will rust. May require yearly painting for protection. Wood: Can take a beating, but it's not extremely durable and can warp. Plastic: Weather proof. Be sure it is a thick, high density, polypropylene, preferably UV-resistant. Pneumatic (air-filled): Easy to push, but can go flat. However, they are easy to replace. Solid or Foam Filled: Come in larger sizes, which makes rough terrain easier to tackle. Capacity: Capacity is usually listed as both weight and cubic footage. Keep in mind that everyone tends to exceed capacity at one time or another, so don't skimp. Carts can vary from a couple of cubic feet on up. A wheelbarrow with a capacity of 6 cu. ft. is a good all purpose tool. Larger sizes will require some strength to control. Ease of Handling: Center of gravity is lower in a cart, making it more stable. Wheelbarrows are pushed from behind, giving more control and maneuverability. Height for loading: Carts, being lower to the ground, require less lifting. Ease of unloading: Wheelbarrows can be tipped and dumped. Many carts come with a removable panel for easier unloading. Maneuverability: Single-wheel wheelbarrows turn easily and handle tight spots well, but can become off balance with a heavy load. Wheelbarrows with 2 front wheels offer better balance. Garden Carts must be pulled, limiting maneuverability, but multiple wheels offer stability and larger wheels can travel over tough terrain. Power/propelled garden cart (gas or electric): Now there really is no excuse for not getting things done. Brakes: If your property is very hilly, brakes will offer more control. Folding tray: Both garden carts and wheelbarrows are now available with either collapsing or folding sides, for easier storage. Compare prices of some top choices for wheelbarrows and garden carts.